Citrix XenDesktop Implementation explores the implementation of Citrix XenDesktop, a virtual desktop infrastructure solution. After introducing the desktop virtualization, the book discusses the installation of a desktop delivery controller through advanced XenDesktop Client Settings. This book briefly discusses the work of desktop delivery controller mechanisms followed by its installation process, integration process of XenDesktop with Microsoft Active Directory, and the configuration of the desktop delivery controller. It then examines the process of installing the virtual desktop onto the server infrastructure, and it follows the installation and integration onto Xen Server, Hyper-V, and VMware hypervisors. Furthermore, it discusses the advanced configuration settings. 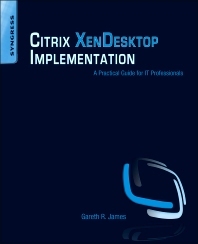 The book covers the installation of the Citrix Provisioning Server and its fundamental configuration. It also explores the configuration of Citrix XenApp for Application provisioning, the integration of virtual applications, and the implementation of virtual profiles into the virtual desktop. The book concludes by explaining the advanced XenDesktop client settings on audio, video, and peripherals. System Administrators, Systems Engineers, IT Architects, Systems Integrators, Citrix Partners, Desktop and Server teams. Gareth Robert James (CCIA, CCEA, MCSE:Security, MCT, VMware VCP, Checkpoint CCSE, RSA CSE, Security+) is an IT consultant focusing on virtualization architecture. He has worked as Citrix Consultant for Citrix Gold and Platinum Partners. He has focused on supporting Microsoft architecture and security, including PKI and firewalls. He has also worked as a Microsoft and Citrix trainer. Gareth holds an honors degree in Electronic Engineering from the University of Natal-Durban. "Gareth James does an amazing job diving deep in to what you truly need to know in order to successfully implement and deploy Citrix XenDesktop. I highly recommend this book to anyone looking into and/or deploying XenDesktop. 5 Stars!"